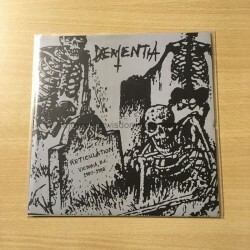 (Description by J. Campbell) This EP represents a compilation of the complete recordings by the Canadian death metal band Dementia. Possessed by the evil spectre of Ross Bay cemetary, the band originally operated under the name Xanimation. Changing their name to Dementia upon the release of their first and only demo entitled simply, "Rehearsal 1/24/88" the band sought to diseminate their wretched disease throughout the underground. After composing two more songs which were unfortunately never documented, Dementia's legacy was abruptly cut short and nothing further was released. Resting silently for over 21 years, the necromancer's incantations have summoned this cult from the dead. The â€œReticulationâ€ EP contains both tracks from that rehearsal demo, as well as two additional previously unreleased ones from the Xanimation era. The sound attained by Dementia is one that can only be captured through the unrestrained passion of youthful violence. Furthermore, it lacks the self-conscious and disingenuous posturing that infects nearly every release in these days of technological hyper-connectivity. Indeed, this may be among the most genuine deathrash releases one will ever find. Listening to the songs on this EP, it is immediately apparent that they were not written and performed by professional musicians; a glance at the photos reveal these kids could not have been older than 15 at the time, and they were in fact only 13 and 14. What the band lacks in technical competence, they more than compensate for with sadistic and unholy posession. While striving to emulate their primary influences such as Sodom, Sepultura, Witches Hammer, etc., Dementia ultimately fall upon their own sound which is every bit as captivating as the afforementioned bands which inspired Dementia. As a monument to an era, style and intensity of metal that has been largely forgotten, "Reticulation" is an incomparable relic freshly discovered. The music also stands on its own in the context of today's underground scene as among the purest manifestations of thrashing death metal to be heard in decades.